Welding equipment is often used in construction, automotive, fabrication, farming and other industries where dirt and oils are present and equipment usage can be tough. Routine maintenance on welders is often overlooked, but is extremely important to ensure the longevity of the equipment. Not only is operation efficiency compromised without proper maintenance, but operator safety is also at risk if routine maintenance is ignored. For this reason, some proper welder maintenance and safety concerns will be covered in the following paragraphs. The most important thing to do with any piece of equipment is to get to know your machinery by reading the operator’s manual included with it. Safety precautions will always be in a section of its own. When in doubt, contact the manufacturer. 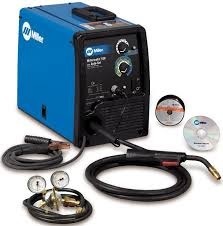 Grounding the welder is important for both operator and the welding equipment safety. If the machinery is not properly grounded, there is great risk of electrical shock to the operator. The first thing to remember is to avoid water and wet working conditions because water is an excellent conductor of electricity; even using welders when sweating excessively can be dangerous for the same reason. Standing on a rubber mat or wooden surface is the best possible scenario. When working outdoors, standing on dirt or concrete can also work well as long as the surface is dry. Loose connections and bare spots on cables are a hazard and should be inspected daily. Grounding the equipment itself can be accomplished by connecting one end of the grounding cable to a metal stud on the machinery. The other end should be connected to a metal stake, driven into the earth. Inspection of welder components is important to ensure proper operation and avoidance of a number of potential safety issues. Cables should be inspected daily for leaks or signs of excessive ware. Worn or leaking cables should be replaced immediately. Wire feeders should be inspected to ensure the electrode drive rolls are clean and free from dirt or debris. They should be inspected, cleaned, adjusted or changed only when the equipment is off. Inlet and outlet guides should also be inspected, cleaned and replaced in the same manner. Torch and gun assembly should be inspected routinely by a trained professional. This is to ensure the proper mixing of gasses and pressure. The condition of the gun should always be inspected by the operator, before each use. Any issues should be reported to maintenance right away. Welder power sources should be disconnected from the power source and either blown or vacuumed out approximately every six months under moderate usage conditions. Electrode holders should be fully insulated and should not have protruding screws. Fully insulated lock type connectors should always be used when connecting welding cables. Electrodes used in MIG welders, arc welders and TIG welders can get hot when the power source is switched on. The electrode wire should never be touched when the power is on – or for a period of time after powered off. Electrical safety devices such as circuit breakers and interlocks should be connected and inspected routinely only when power is off. Terminals and electrical parts should all have insulated covers. Gas Cylinders and regulators should be inspected daily for damage and leakage. Any faulty components found, should be replaced immediately by trained professionals. Proper maintenance of all machinery utilized in industrial applications is the job of the operator, supervisors and the maintenance department. Welders and welding equipment are not exempt. Great knowledge about Welders and Welding Equipment. I appreciate your work.